The eggs got put away and I had a little nest with no bird. Then I saw my friend Michelle’s sweet little birdie, all bedecked with a beaded crown. I can almost hear bird song from the tree now! An adorable little bird from Shelle Hill on Etsy. The bird was going to perch on one of the library shelves in a different room. So I will have to visit Shelle Hill on Etsy again and get another bird for the library. A bird with words is the perfect bookshelf visitor. When a bird needs a little help…. It was. A tiny Ruby-crowned Kinglet had flown into the sliding glass door and lay on the deck. While we watched, the little bird got to his feet. But he was not well. The tiny bird sat stunned on the deck. He wobbled around a bit and panted hard. Finally, he fluffed up all his feathers and tucked his head in and made himself into a tiny feathered ball. The Ruby-crowned Kinglet fluffed up his feathers and curled into a little ball. His breath came in shudders and heaves. We watched in distress. The tiny Kinglet shuddered so hard I feared he was dying. It was so cold outside. Would he be ok? We were very glad the cats were inside! Cats love birds so of course Matey purred with glee and wouldn’t take her eyes off the little bird through the glass. We finally put Matey in the basement out of annoyance of her and respect for the bird. He kept his head tucked in, shuddering and quaking and I kept expecting the little feathered ball to fall over. We looked up info on what to do. The advice was to carefully lift the bird into a box lined with a towel and wait. So that’s what we did. My son lifted the little feathered ball and placed it in the box, then backed into the house and slid the glass door shut. The bird stood up and balanced and revived in the warm towel-lined box. Then we waited, watching his every move. The tiny Kinglet stood up and we got a glimpse of his beautiful ruby crown. The little Kinglet looked around for a couple minutes and without even testing his wings, suddenly flew away. We were so glad the bird was ok! There’s not much you can do for a bird that crashes into a window and sometimes the bird will be stunned for hours. The little Kinglet was on the deck for barely 20 minutes in all. I was glad the cats were indoors and shut in the basement. I was glad we were able to look up info online. It was good that we had a box and a towel to help warm the stunned bird. And though we couldn’t do much to help, we hovered over it with concern. Then I remembered what Jesus said. If God cares so much for tiny birds that he made sure we kept the cats locked up and provided a warm towel, surely he will hover over us when we are curled up and in need of care. The bird was chirping so cheerily! I couldn’t get close enough for a good photo but did get a quick pic before it flew away. 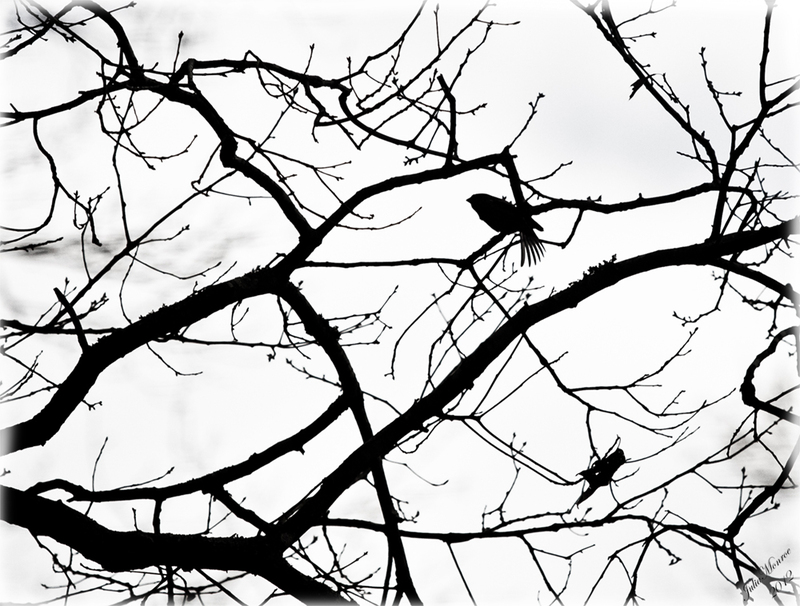 This photo will be the basis for a bird silhouette fabric to add to my collection on Spoonflower. 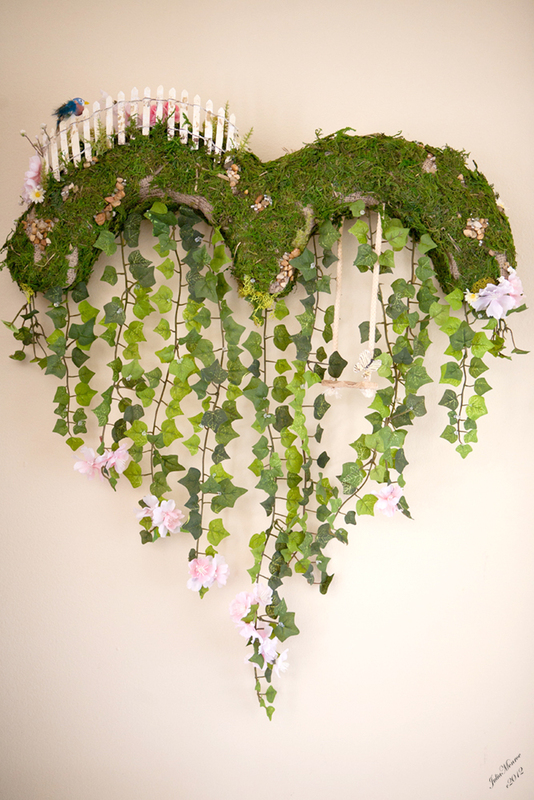 I’m quite happy to finally finish my Cascade Heart Wreath, Garden theme. This is the first of four Cascade Heart Wreaths I’m making, all completely different in color and style. But they all start with a Styrofoam frame forming the top of the heart and a cascade of hanging trim forming the lower part of the heart. I have been wanting a heart shaped wreath for some time now but wanted a more organic, flowing design. Making a heart with a cascade bottom was the perfect solution. An unexpected bonus: when the cascade is made of lighter material, it flutters with air movement. Having that movement is soothing to me, like a gentle spring breeze catching leaves. This wreath reminds me of the kind of garden you would discover at the edge of property, not always tended, sometimes forgotten, a little bit wild but still beautiful. 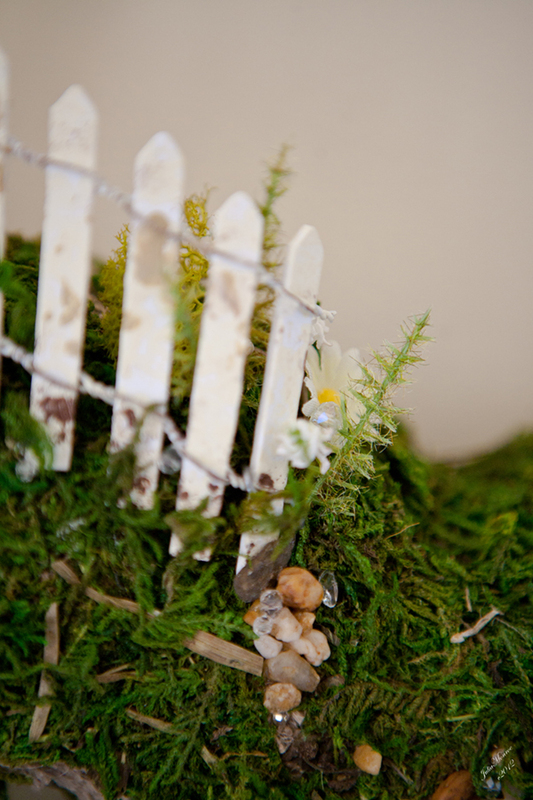 Pockets of little stones are scattered around the mossy knoll and the picket fence is a perfect resting spot for a baby bird. I adore swings and decided this garden needed a secret swing, hidden in the ivy. 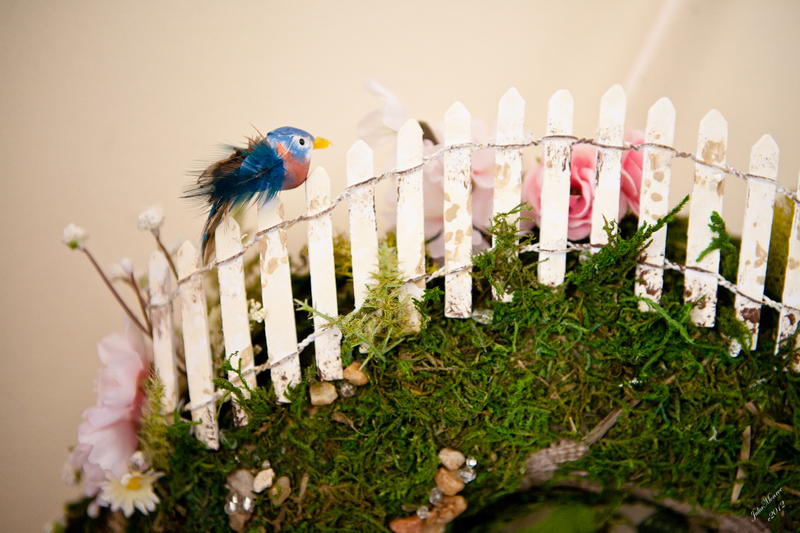 Cascade Heart Wreath - A baby bird perches on the picket fence. Cascade Heart Wreath - The wreath is embellished with moss, stones, ferns, flowers and tiny clear, glass beads, like dew. 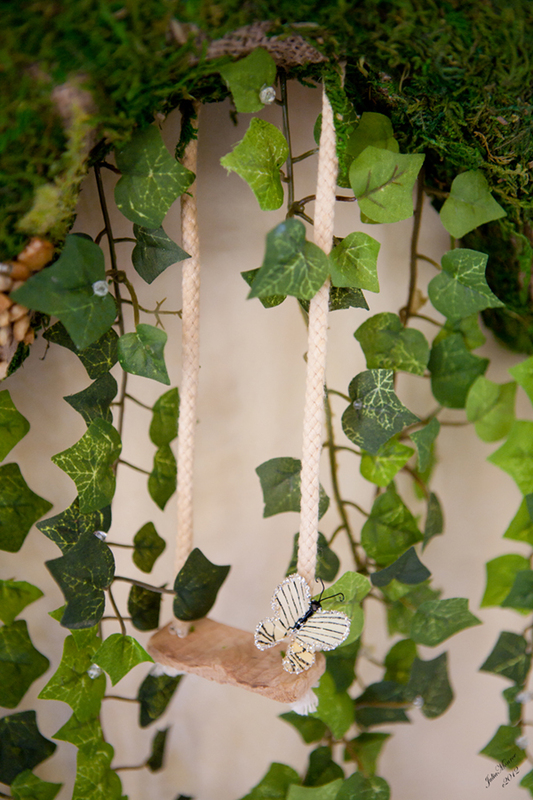 Cascade Heart Wreath - A tiny butterfly perches on the rope of a secret swing hanging amidst the vines. 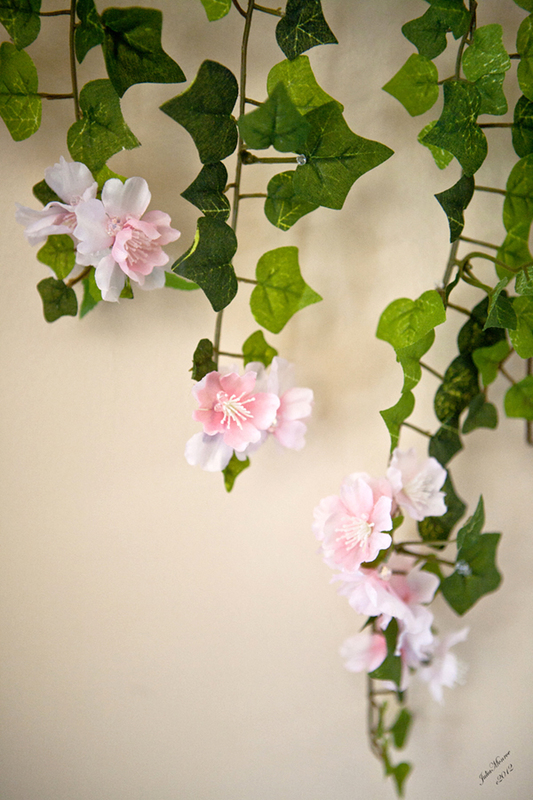 To see the tutorial for making a Cascade Heart Wreath, click for more.